Sign up for our Newsletter. 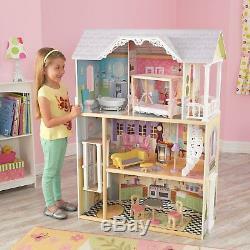 The Doll House Kaylee from KidKraft is designed and decorated in the style of a southern mansion, over three floors incorporating a Kitchem, Living Room, Bathroom and Bedroom. Equipped with an elevator connecting the ground floor with the first floor and an elegant spiral staircase leads up to the bathroom and bedroom. 10 detailed pieces of furniture. Moving elevator that takes the dolls from the ground floor to the first floor. Kitchen door can be opened and closed. Large windows on both sides. Suitable for fashion dolls up to 30 cm. Large enough that more than one child can play at once. Made of wood composite materials. You may return any item to us within 14 days, providing it is in its packaging and is in a saleable condition. We may send a courier for larger items. Happy Kiddies was established in 2008. We are a family run toy company and sell such brands as Little Tikes, Kidkraft, Le Toy Van and Smoby amongst others. The item "Kidkraft Kaylee Dolls House" is in sale since Monday, October 02, 2017. This item is in the category "Dolls & Bears\Dolls' Miniatures & Houses\Dolls' Houses". The seller is "happykiddiesonline" and is located in London, London.